And my back hurts—but its all in a good cause. I spent several hours this afternoon painting my shawl. It's still damp (it actually dried out too fast, and I had to use a spray bottle of water to re moisten it). I wanted the paints to bleed as I painted, and that works best if the fabric is damp. By the time I was done, my left hand was several colors of the rainbow—I could have worn gloves, but I wanted to be able to feel if the paint was dripping (and drip it did at times)--and gloves—while they would have kept my fingers clean, also would have left me with less sensation. So here is the first glimpse—By afternoon—the sun is full in the window—and I get strong sunlight and shadows (from the door jam, and the coffee table leg) –and its not the best view. The strong sun light washes out the color a bit, the shadows create unevenness... but still you get the idea—Amazing! I started in the center and worked my way out. The colors and paint are uneven (which is fine—I don't want the look of something machine printed, or even some thing (block) printed—because some parts dried faster than others (the open door and gentle breeze plus the sun light made a big difference!) and I had to stop and spritz the shawl to keep it evenly damp—or close to evenly damp. I have another inch worked on the vest--(and will do more tonight) but I am taking it easy for the rest of the day. 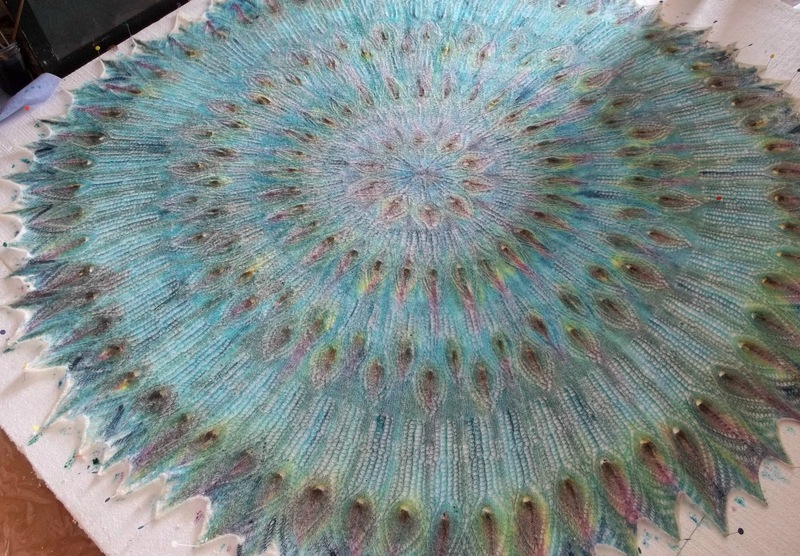 I agree with everyone else, the shawl is absolutely gorgeous!!! looking at this beautiful creation.